The man playing the role of Edward Snowden in the $300 million Oregon production of the Patient Protection and Affordable Care Act will not rot in prison for blowing the whistle on former governor John A. Kitzhaber—who in this Left Coast drama was playing the role of Hillary R. Clinton. Michael Rodgers was the interim administrator of the state's Enterprise Technology Services division of the Department of Administrative Services and a man with 200 employees under his sway and 15 years on the books when Feb. 5 Jan Murdock sent him an email directing him to destroy all of the governor's emails on personal accounts that were stored on state servers. The emails in question revealed that the governor's political fixer Patricia McCraig had torpedoed Cover Oregon as a political maneuver executed to help the governor's campaign. Like other states, setting up its own healthcare exchange was an IT nightmare and the frustrations with Cover Oregon were starting to hurt the governor in the polls, so McCraig ordered the state to shut it down. Then, McCraig blamed Oracle, the Cover Oregon contractor, for the mess. Then, McCraig engineered the state's $5.5 billion lawsuit against Oracle—just to push the point home that nothing was the governor's fault as he campaigned for a fourth term. 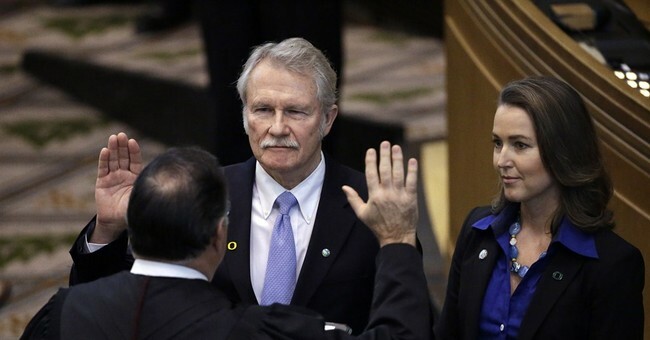 Murdock, Kitzhaber's personal assistant, handled personal matters for Kitzhaber. She is still on the job now working for Gov. Katherine Brown. When Rodgers got the email from Murdock, he went to the local alternative paper, and gave them the 6,000 emails Murdock wanted destroyed. “Emails stored on state servers are considered public records and deletion of such is a violation of Oregon State law,” said Rodgers on his GoFundMe.com page his wife Jennifer launched to raise funds for his legal fees. The fund has more than $10,000 in contributions, including eight contributions of $250 or more and one anonymous for $1,000. In a June 3 statement, Walt Beglau, the Marion County district attorney, said that he would not pursue charges against Rodgers because he was acting in the interest of protecting what he believed to be public records. In the district attorney's summary of Rodger's actions, it become clear that Kitzhaber and his staff recognized they had a problem after the Oregonian newspaper Feb. 2 filed a Freedom of Information Request for the governor's emails. The Oregonian in its own endorsement of Kitzhaber for a fourth term acknowledged that the one-time emergency room physician was over incompetent, incurious about the waste of public funds or the awkwardness of his treating his consort as a co-governor and unnaturally obsessed with environmental issues. The governor got his term with help on the campaign trail from President Barack Obama and was sworn in Jan. 12 for what turned out to be a one-month gig. There is no doubt Rodgers is the one who pushed Kitzhaber out the window. Even the people of Oregon, among the most docile hostages of one-party rule by the Democratic Party, perked up when they heard thousands of emails were going to be destroyed before they found out what happened to the $300 million their masters burned through to establish Cover Oregon. There have been other Obamacare burn pits, but nothing compares to the $300 million for Cover Oregon, which enrolled no one by the time Brown and the legislature mercy-killed it in April. For all of the money wasted and all of the lawsuits and awkwardness, at least the people of Oregon have a fighting change to find out how their healthcare reform became a national punchline. What about the rest of us? When is the next Michael Rodgers or Edward Snowden going to step forward to let us now what these last six years of Obama has been about anyway? Only then, can the healing begin.